It's an engine whose distinctive roar can make your heart leap. 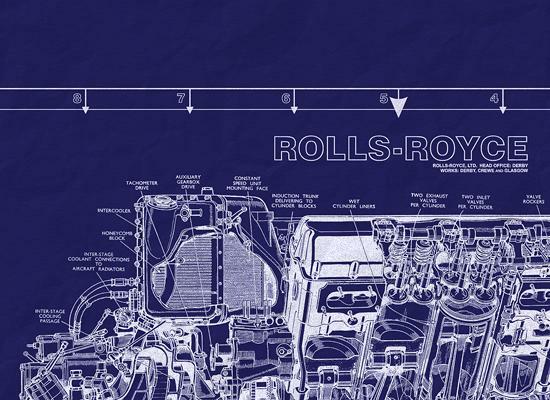 The successor of the great Merlin engine, the Rolls Royce Griffon played its part in helping to win the Second World War when it was fitted to iconic warbirds such as the Spitfire. Griffon-powered Spitfires were so fast that they were capable of flying in parallel with German V1 rockets… then close in to 'tip' the rockets' wing… cause it to crash. Continued from above… degree V-12 with 6.0 inch bores and 6.6-inch stroke giving a 2,239 cubic inch displacement, same parameters as the "R". But this was a totally new engine featuring many design updates. Development started in 1939 and compared with the Merlin development went quite smoothly. Several deviations were made from previous Rolls-Royce V-12 practice. The camshaft and magneto drives were taken from the front offering two advantages. Firstly, the critical timing function of the valves and the ignition would not be left to the mercy of the torsional excursions of the crankshaft. Secondly, the length of the engine was reduced, thus satisfying one of the requirements of the Griffon that it should be capable of retrofitting in existing Merlin powered aircraft. In early 1941, the Focke Wulf 190 menace appeared over England for the first time. It created havoc with it's superior performance over anything the British could throw against it at the time. Immediately plans were put in place to shoe horn the Griffon into the Spitfire - this was not an easy task. The finished product was a masterpiece of engineering incorporating the state of the art technology for engine installation at that time. From the firewall forward everything was new. The oil tank was relocated from it's previous position under the engine to the firewall. A fabricated sheet aluminum mount, similar in concept to the P-51, replaced the previous chrome moly tabular mount. Three bumps at the front of the cowl accommodated the valve covers and the single large magneto. Due to the much greater heat rejection requirements of the Griffon, the familiar under wing radiators now grew, having far greater depth for additional radiator capacity. Spitfire XII's were the first recipient of the Griffon powered by the Mk. III or IV variants with single stage, two speed supercharging. A number of subsequent Spitfires retained Merlin power but towards the end of Spitfire production all were powered by Griffons. 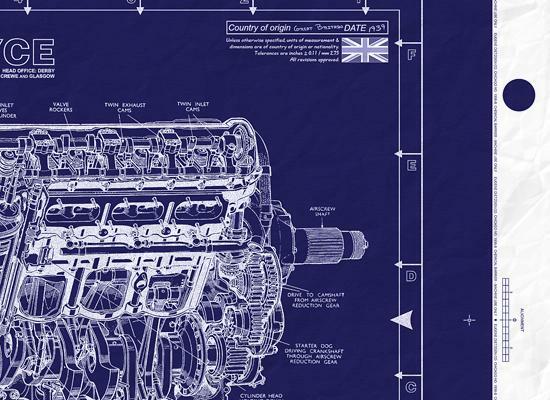 Starting with the Spitfire XIV, two-stage, two-speed intercooled, aftercooled superchargers became standard, all of which were Griffon 60 series engines. Several deviations were made from previous Rolls-Royce V-12 practice. The camshaft and magneto drives were taken from the front, offering two advantages. First, the length of the engine was reduced, thus satisfying one of the main requirements of the Griffon, that it be retrofitted in existing Merlin-powered aircraft. Second, the critical timing function of the valves and the ignition were not left to the mercy of the torsional excursions of the crankshaft. The magneto and camshaft drive gears tapped off the propeller reduction gear for their drive requirements, along with the starter. 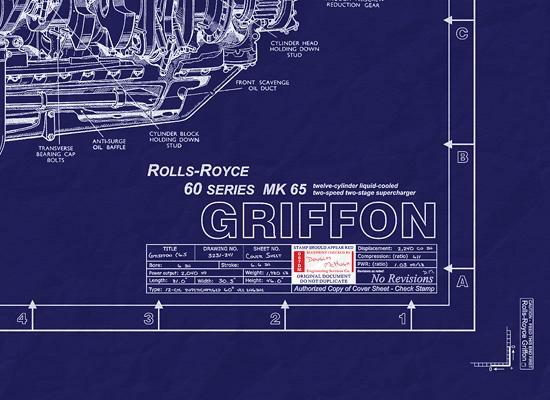 Early development and production Griffons also drove the supercharger from the front by means of a long quill shaft that ran under the crankshaft, driven off a gear on the front of the crankshaft. Because of various manufacturing problems, this promising idea was quickly dropped. In later engines, the supercharger took its drive in a similar way to the Merlin, by a quill shaft splined into the No. 7 rear main journal of the crankshaft. Early engines featured single-stage, two-speed supercharging, again copying Merlin practice, but beefed up to take the heavier loads imposed upon it. The crankshaft, also like the Merlin, was a 120?, nitrided, forged chrome molybdenum steel alloy unit supported in seven cross-bolted main bearings. However, the firing order was different from the Merlin. A 60? V-12 with a 120 crank and paired throws had a number of permutations on ideal firing order, not one superior to another provided the intake system was "tuned" for the firing order chosen. However, the exhaust note varied. This gave the Griffon its classic "Griffon Growl" exhaust sound... impressive! Different valve timing also contributed to the difference in exhaust note. The Griffon had a relatively modest 28? of overlap and 248? of cam duration compared with the Merlin's more radical 43? of overlap and 263? of duration. Later Merlins had 70? of overlap and 288? of duration. The crankshaft rotated in the opposite direction to that in the Merlin. In the late 1930s, the Society of British Aircraft Constructors (SBAC) established standardization guidelines, including the direction of propeller rotation, which was clockwise when viewed from the front. Consequently, with a simple spur reduction gear, the Griffon crankshaft rotated in the opposite direction from most previous Rolls-Royce aircraft engines . A further refinement was made to the propeller reduction gear pinion drive by incorporating a floating ring at the crankshaft end featuring male and female splines. This was an effort to further isolate the pinion gear from the torsional vibration of the crankshaft. After the debacle with the ramp head on the Merlin, the Griffon featured the by now ubiquitous and well-proven Kestrel-based combustion chamber, which traced its heritage back to the Curtiss D-12. Another lesson learned from Merlin experience was the incorporation of end-to-end crankshaft lubrication ; indeed, this feature proved so successful that all subsequent Rolls-Royce piston engines employed it after its introduction in the 100-series Merlin. One of the design peculiarities of the Merlin that dated to the early 1930s was the extensive use of external oil lines rather than the more modern internal oil galleries. These external oil lines tended to be maintenance headaches, and at times were major contributors to oil leaks and the occasional fracture, resulting in serious engine damage. By comparison the Griffon was a clean design with few external oil lines. Accessories required for aircraft systems such as electric generators, hydraulic pumps, vacuum pumps, and so forth, took their drive from a remotely mounted gear box driven from a power take-off from the wheelcase. The Merlin on the other hand had accessories cluttering the exterior of the engine with the vacuum pump and propeller governor mounted on the front, and the tachometer generator or tachometer drive, air compressor, and hydraulic pump were mounted on the cylinder heads driven off the camshafts. The lower crankcase also offered a drive take-off for a hydraulic pump, overall a somewhat disorganized arrangement. Fitting the Griffon into a relatively small, light, single-engine aircraft such as the Spitfire created some handling difficulties primarily due to the enormous torque reaction. This could amount to a very significant 4700 lb-ft at take-off power. Designing a gear reduction unit for a contra-rotating propeller turned out to be the definitive answer after various aerodynamic attempts such as enlarged vertical stabilizer area presented only partial solutions. Eighty-series Griffons were the first to receive dual-rotating propeller drives and were introduced just prior to the end of World War II. This was accomplished by having two pinions and two reduction gears. The front pinion and driven gear were of a smaller diameter than those in the rear. An additional idler gear in the front reduction gear resulted in opposite rotation. The reduction gears drove coaxial, contra-rotating propeller shafts. Contra-rotating propellers were essential for the Navy version of the Griffon Spitfire, known as the Seafire, because of the extremely hazardous nature of carrier landings, particularly during a go-around when maximum power needed to be applied at low altitude and low air speed. Torque reaction pulled a Griffon Spitfire with a single propeller to the right, toward the carrier island, obviously a very precarious situation. Other internal features of the engine followed Merlin practice. 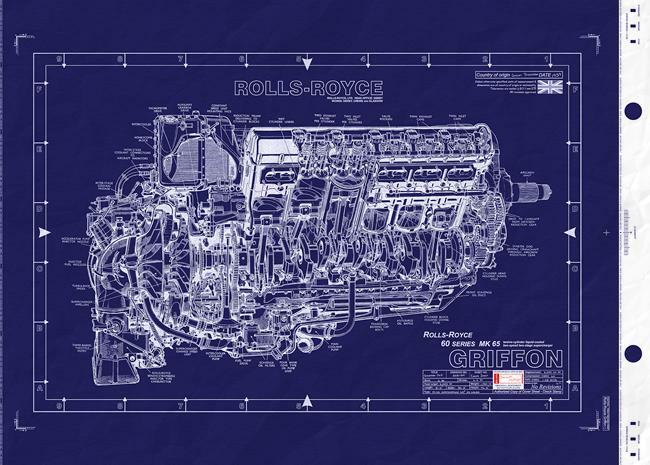 Early Griffons entered service with two-speed, single-stage superchargers, rated at 1735 hp at 16,000 ft, which soon gave way to two-speed, two-stage superchargers with intercooling and aftercooling , similar in design to the Merlin, rated at 2350 hp. This was achieved with the extremely high manifold pressure of 25 psig or 80 in Hg. This manifold pressure required ADI and 150 PN fuel to control detonation. The two-speed supercharger shifting was automatic, relying on an aneroid switch controlled by atmospheric pressure to shift to the appropriate blower speed. Centrifugal bob weights mounted on the blower clutches added to the drive capability of the clutches?the faster it spun, the harder the clutch grabbed. When the blower shifted, a small degree of clutch slip was built in, otherwise the accelerating forces would damage and possibly strip the blower drive gears. The clutches also absorbed some of the torsional vibration emanating from the crankshaft; this design feature may help explain why no Rolls-Royce piston engines?except for the Eagle 22, the last of their piston engines?required any dynamic crankshaft counterweights. A few examples of the 100-series Griffon were built with three-speed, two-stage supercharging. The only application was the Supermarine Spiteful and its Navy counterpart the Seafang, which was a development of the Spitfire featuring laminar flow wings. Two-stage, two-speed Griffons, the 60 series , were typically rated at 2045 hp at sea level in moderate supercharge and 2245 hp at 9250 ft in full supercharge. All horsepower ratings were at 2750 rpm. Carburetion could be accomplished by a three-barrel injection carburetor, built by Rolls-Royce and based on the Bendix injection unit . Alternatively, carburetion was accomplished by a single-point Rolls-Royce injection unit, which, like the Bendix unit, sprayed atomized fuel into the first-stage supercharger impeller eye but operated on the speed density principle.